It has opened my mind to a whole new world... a world where I don't necessarily think about myself - but I think about appreciating others... especially my husband. I like this new me and where I'm going. I'd like to write a whole book review about it, but if you see the Amazon reviews - they are plenty accurate... at least the positive ones. The people who give one or two stars are simply not humble enough to see through the trees. Because you can't change people... you can only change yourself! That's what I'm trying to do. I'm trying to be the best me I can be. That's also why I love Personal Progress. By the way, I've heard you can now do Personal Progress online... that's so cool. You can even send your project proposals to your Young Women leader online. I love how the Church is so hip and up on things Internet related. Has anyone seen this Young Woman video 195 dresses? It's so cool. The LDS.org Youth page is really good. My husband is also hooked on the youtube Mormon Channel - Our People section. They are all very inspiring. But even though, I will not be the next food blogging star... I will share this - because this is my blog and I can blog what I want... and afterall, the main goal of my blog originally was to be my online recipe box so to speak... here is what I did with the kids recently... it was fun and it was one of the first times when I let them roll out the dough and cut out the cookies and Ella even got to eat cookie dough a few times - she's fast - I tried to stop her but I wasn't fast enough... anyway, I took a video of it and I hope to be able to post that eventually - when I learn how to edit the video and put all the pieces together. 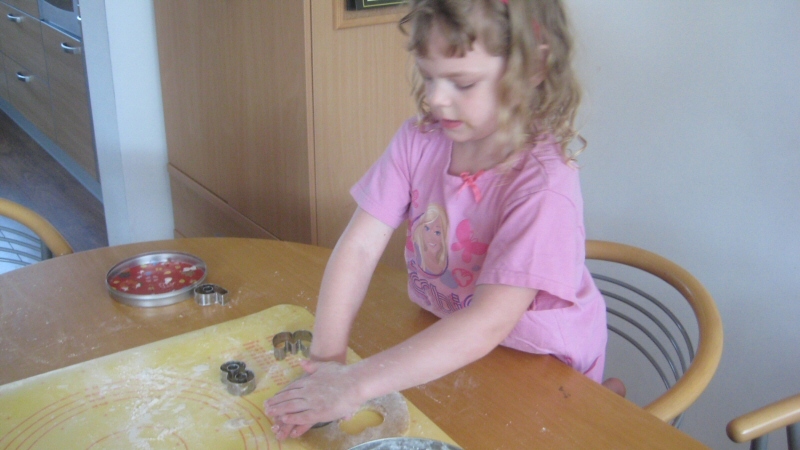 Here, I tried to catch Ella before she shoved some dough in her mouth... I was too late... she chomped it down fast! 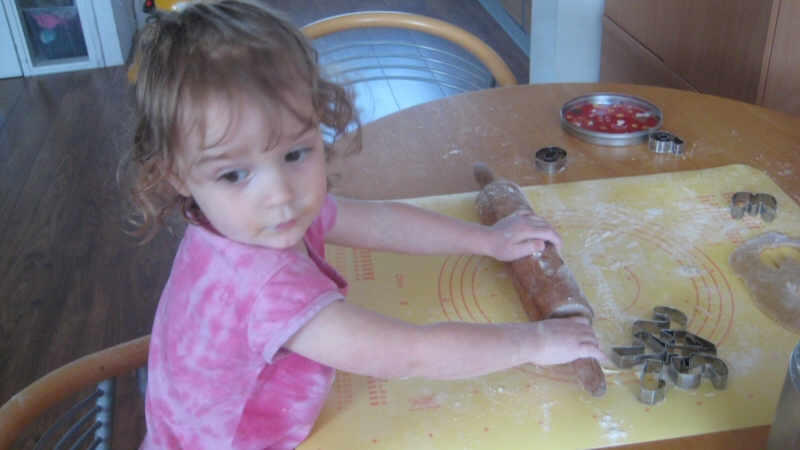 Ella with the rolling pin... I realize this is a fuzzy photo - kids are difficult to get crisp pictures of. 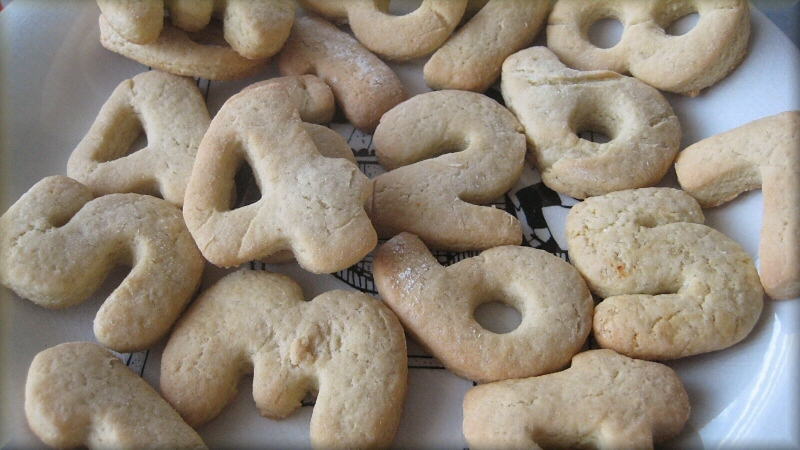 The final cookies - these only take 6 minutes to bake! And they are low fat, too. Sift together flour, salt and baking soda, set aside. Combine oil, sugar and flavorings in bowl of food processor. Add egg. Beat at medium speed until blended. Using dough hook, add in flour mixture and beat until looks crumbly. Add milk and continue beating until good dough ball. Take out and place into plastic wrap and refrigerate until ready to use. Keeps quite a while in the fridge - last time I waited almost two weeks before using it up and it was fine. 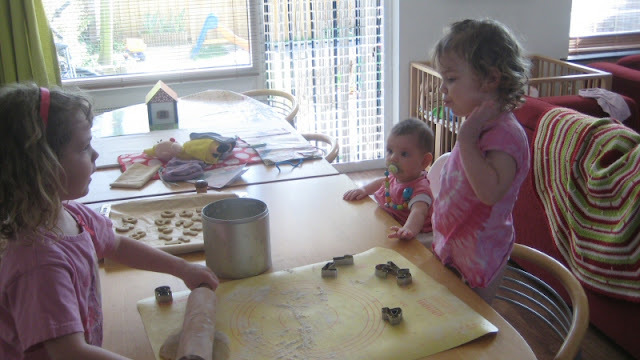 Now, the original recipe calls them drop sugar cookies, which means you can drop by teaspoonfuls and bake as is, but I like to refrigerate the dough, then roll out on floured surface for rolled sugar cookies - and have fun with the kids cutting out with any shape imaginable. You can also roll the dough into a log - wrap in plastic, refrigerate or freeze then slice and bake as follows. Or with oven pre-heated to 400-F degrees bake for 6 to 8 minutes or until just barely brown. (Avoid overbaking). Remove to cooling rack. I enjoyed reading your blog, seeing pictures of the girls, and reading about your personal growth. You ARE an amazing woman!